Bryndzové halušky is one of the national dishes in Slovakia. This meal consists of halušky (boiled lumps of potato dough similar in appearance to gnocchi) and bryndza (a soft sheep cheese), optionally sprinkled with cooked bits of smoked pork fat/bacon. 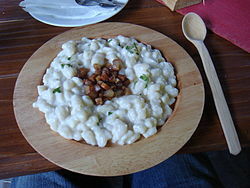 Žinčica is traditionally drunk with this meal. There is an annual Bryndzové Halušky festival in Turecká that features an eating contest. ^ a b c d Cravens, Craig Stephen (2006). Culture and customs of the Czech Republic and Slovakia. Westport, Connecticut: Greenwood Publishing Group. p. 75. ISBN 0-313-33412-9. OCLC 67240291. ^ a b c Dunford, Lisa (2007). "Slovakia: Food & Drink". In Paul Smitz; Aaron Anderson; Steve Kokker; Brett Atkinson; Becca Blond (eds.). Lonely Planet Central Europe. Hawthorn, Victoria: Lonely Planet. p. 452. ISBN 1-74104-301-8. OCLC 85763619. ^ a b c d Sinkovec, Magdalena (2004). "Bryndzové Halušky / Potato Dumplings with 'Bryndza' Sheep Cheese and Bacon". Culinary Cosmic Top Secrets A Nato Cookbook. Lulu. pp. 115–16. ISBN 1-4116-0837-2. ^ "Cheese Description: Bryndza". Cheese.com. Retrieved 1 March 2009. ^ Reynolds, Matt (21 June 1999). "Three liters of bryndzové halušky small work for hefty men in national eating competition". The Slovak Spectator. Retrieved 1 March 2009. ^ "Halušky Turecká" (in Slovak). Občianske združenie Halušky Terchová. 2008. Archived from the original on 27 February 2009. Retrieved 1 March 2009.